THE light-sedan dog-fight requires steely nerves, more than your average street-smarts and probably as much brain as brawn. It is an up-hill battle, this segment, with cars competing not only with the more trendy hatches but also with the ever-growing SUV market and the powerful small-car band. You have to have faith in your product and be able to dish up the best value and performance at an affordable price, or certainly present the illusion of doing so. 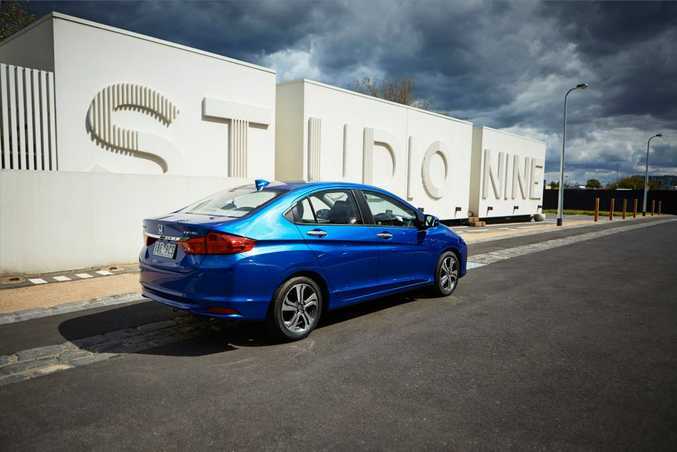 The new Honda City is more reality than smoke and mirrors, charged with both keeping the current group of faithfuls but also presenting an enticing package for new, younger drivers. You don't expect a light car to have much space, its appeal generally lies elsewhere. But the new City - longer, wider and taller than its predecessor - has it in spades. So much so, in fact, that there is more than enough legroom in the back to stretch out in, more in some cases than competitors in the segment above. 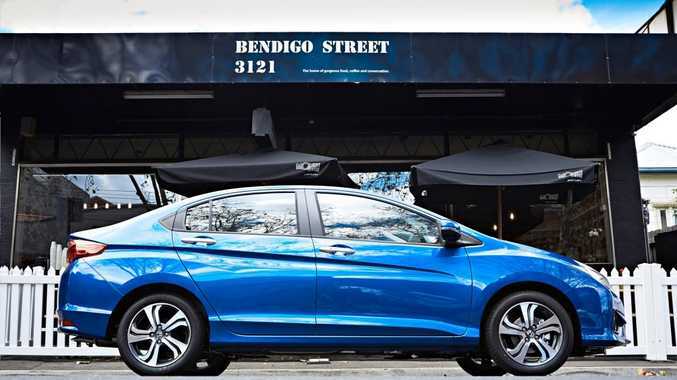 The interior is modern in set-up and choice of fabrics and trims with Honda's Display Audio Infotainment system taking pride of place in a slick clutter-free dash. The 17.7cm touch-screen has good graphics, is easy to navigate and is the basis of the "mirroring technology" which allows you to use the apps on your Smartphone (just Apple at this stage) through the car's infotainment system. Such detail is likely to lure buyers who keep pace with the speed of modern technology but even they won't be impressed by the very ordinary flat seats, which are okay for short distances but lack the support and bolstering that make longer journeys more comfortable. Plastics, it will come as no surprise at this price point, are on the cheaper side but in general the fit is good and we had none of those squeaky niggles that can be so annoying in cars in of this size. The City certainly lives up to its name, as it is in the confines of the urban jungle that it is at its best. Powered by the carryover 1.5-litre four-cylinder petrol available with a auto CVT only in our range-topping VTi-L, the City knows its limitations and is happy to work within them. There is not much speed off the mark and it can feel stretched when asked for a little extra on the highway but it is a sensible drive around town, easy to manoeuvre, capable of dealing with changes in direction and nimble enough around tight traffic circles and shopping centre car parks. There is little steering feel and I would think twice before slamming it into a hairy corner and hoping for the best but it will stick gainfully to the task and get you from A to B in relative comfort. There seems to be a fair bit of road noise and you do feel more than the odd bump but it does settle down into a fair rhythm with the well-matched CVT an eager and accomplished performer. The VTi-L adds 16-inch alloys, keyless entry with push-button start, fog lights, climate control, leather-wrapped gear knob and steering with paddle shifters and two rear 12V outlets to the cruise control, Bluetooth and audio streaming, reverse camera, power windows and steering wheel controls that come standard with the entry-level VTi. Safety features include six airbags, anti-lock brakes, stability and traction control, hill-start assist and emergency stop signal. 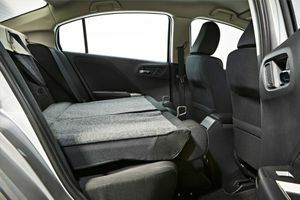 Most manufacturers are giving the light-sedan segment a wide berth, deciding instead to concentrate on the better performing light hatch or popular small car offerings, but the City will still have to contend with the Mitsubishi Mirage LS (from $17,490), Hyundai Accent (from $22,990), Holden Barina (from $18,490) and the outgoing Nissan Almera (from $20,990). The Honda City claims to have one of the best economy rates in this segment - 5.7 litres/100km. The best we got was 6.3 litres/100km which is a heady enough performance for our money. Honda offers a three year/100,000km warranty and a five-year/100,000km fixed-price servicing program. We like the versatility of the infotainment system which allows you to access apps like the Honda Sat Nav, which costs $49.99 for a three-year subscription with an iPhone - so much cheaper than if sat-nav was an optional extra - although owners of Android phones will be a bit miffed until they come online. With its sculpted side panels, wraparound tail lights, elegant grille and aerodynamic body the Honda City certainly won't embarrass you in the trendier parts of town. You can improve your street cred with the optional Sports Pack, which includes a Modulo designed rear wing spoiler, side skirt set and front and rear under spoiler. Details: Four-door front-wheel drive light-sedan. Engine: 1.5-litre i-VTEC in-line four cylinder petrol generating maximum power of 88kW @ 6600rpm and peak torque of 145Nm @ 4600rpm. Bottom line plus on-roads: $21,390 (entry VTi from $15,990). What we liked: On-trend spacious interior, luxury inclusions, large boot. What we'd like to see: More power, rear air vents, reverse sensors. Warranty and servicing: Three-year/100,000km warranty. Servicing intervals are six months or 10,000km. Capped price servicing alternates been $236 and $272 over the first 10 services.